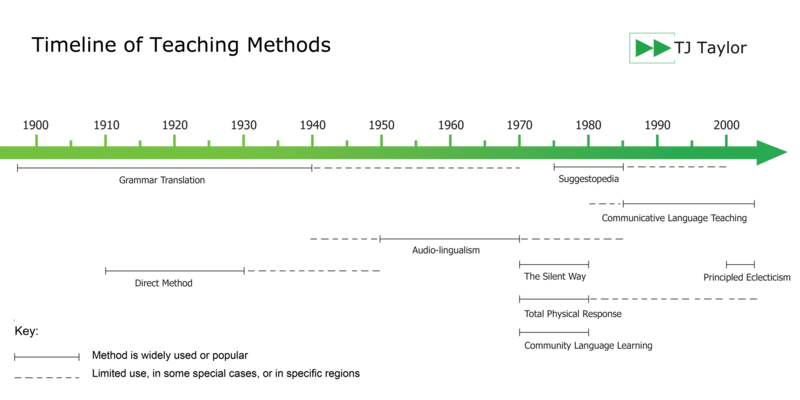 An explosion of new and radical approaches to learning a language came to light in the 1970s. These approaches are often grouped under the title of Humanistic Approaches due to their method of concentration, touching on the innate ability and capacity that all learners are presumed to possess. This method is based on the idea that the mind has great potential and can retain information by the power of suggestion. This teaching method uses relaxation as a means of retaining new knowledge. In their initial lessons learners receive large quantities of information in the new language. The text is translated and then read aloud with classical music in the background. The scope is to supply an atmosphere of total relaxation where understanding is purely accidental and subliminal. Using large quantities of linguistic material introduces the idea that language understanding is easy and natural. In the following lesson, learners use the material in a variety of communication activities. The original learning techniques and theory developed by Georgi Lozanov have since developed into the Accelerated Learning movement. Allow students to produce when they are ‘ready’. Improvement comes from supplying communicative input, not from forcing production. This method draws on the basic principles of how young children learn their first language. Developed by James Asher, this teaching method involves a wide range of physical activities and a lot of listening and comprehension, as well as an emphasis on learning as fun and stimulating. Total Physical Response has limitations, especially when teaching abstract language and tasks, but is widely considered to be effective for beginners and is still the standard approach for young learners. Another example of a method categorized under the Humanistic Approaches, with this technique the teacher is supposed to be practically silent – hence the name of the method – and avoids explaining everything to the students. This method is based on a problem-solving approach to learning, whereby the students’ learning becomes autonomous and co-operative. The scope is to help students select the appropriate phrases and know how to control them, with good intonation and rhythm. The teacher does not repeat the material nor supplies the phrases that the student has to imitate, and there is no use of the learner’s native language. Patterns contain vocabulary, and coloured guides for pronunciation are used to assist the teacher in guiding the students’ understanding while saying the least amount possible. Also sharing many of the same principles as the Silent Way, this technique was relatively short-lived. Seeing the student as a ‘whole’ person, the method involved students sitting in a circle and encouraging them to use their feelings, intellect, relationships and reactions.